Copyright 2008 Peanut Butter & Co.
1. Start with preparing peanut butter panna cotta. Make vanilla sauce with the first five ingredients. Add coarsely chopped peanuts to the milk, sugar, vanilla bean, and salt and bring to a boil. Cover and allow to steep for as long as possible. 2. To prepare the joconde sponge, whip the eggs and confectioners’ sugar on medium speed until very light, 15 to 20 minutes. Combine the cake flour with the almond flour and sift together. Whip the egg whites with the sugar until medium peaks. Fold one third of the beaten egg whites into the egg yolk mixture and gradually fold in the dry ingredients. Fold in the remaining egg whites followed by the melted butter. Evenly spread on a sheet pan and bake at 400°F for 5 to 7 minutes. Transfer to another sheet pan to cool completely. 3. To make graham cracker base, combine thoroughly the graham cracker crumbs, ground peanuts and butter. Slightly press the crust into a prepared pan and cut with 2 1/2 inch round cutter. Bake at 350°F for 8 to 10 minutes. 4. Cut the acetate 2 1/4 inch by 8 1/2 inch and put around inside the ring molds. Cut the Joconde sponge 2 1/4 inch by 8 inch. Spread peanut butter on top of the graham cracker base and put in the bottom of the molds. Put the Joconde sponge around inside the ring molds. Set aside. 5. To finish the peanut butter panna cotta, strain it into a clean saucepan and bring back to a boil. When it gets to boil, temper the egg yolks whipping constantly and bring it back to the heat to make nappe. Blend the vanilla sauce, chopped peanuts that have used for steeping and peanut butter together, strain, add the melted gelatin, and cool to 70°F. Pour into molds and freeze until set. 6. To prepare the caramel mousse, start with making soft caramel. Bring the 1/4 cup plus two tablespoons heavy cream to a boil and keep it warm. Make caramel with the sugar and the lemon juice by melting sugar over medium heat with lemon juice until it boils stirring constantly. Slowly add the warm heavy cream followed by the butter. Add the melted gelatin and keep warm. Whip the 3/4 cup heavy cream to soft peaks and keep it in the refrigerator. Make sabayon with the egg yolks and the sugar and make Swiss meringue with egg whites and sugar. Fold sabayon into the caramel and then the meringue. Fold in the cream and pipe immediately. 7. Assembly: Pipe 1/4 ounce of the caramel mousse into each mold and put the peanut butter panna cotta on top of it. Pipe more mousse up to the end of joconde sponge. Freeze until completely set. 8. 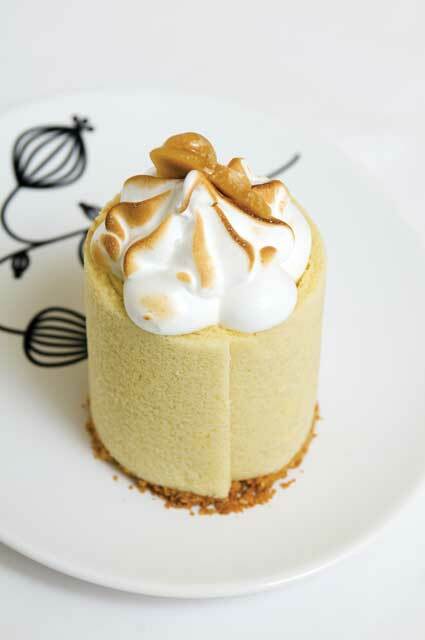 Garnish: Make Swiss meringue and pipe on top of the cake. Pipe pearls with #4 tip around the cake and use #3 star tip for the center. Slightly torch it. To make caramelized peanuts, combine sugar and peanuts in a heavy sauce pan and caramelize sugar. When sugar is melted, tilt pan to evenly cover peanuts with caramelized sugar. Take off of the heat and add the butter. Mix well with a wooden spoon. Place on the parchment paper and cool it off.